The wheels on this page are designed to operate on right angle electric grinders for cutting bolts, sheet metal, and other metal parts. These wheels will cut both ferrous and stainless steel. Available in 4-1/2" , 5" and 6" diameter in both flat Type 1 and raised hub Type 27 shape. 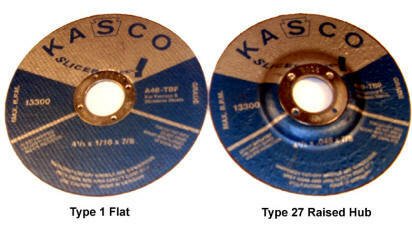 T-1 flat wheels need to be mounted between two equal diameter flat flanges on your grinder. Do not use this Type 1 flat wheel if you have a cup shaped back plate on your grinder. Only use raised hub T-27 wheels if you have recessed shape back plate. T-27 wheels need to mounted with same tool flanges that are used with raised hub grinding wheels. Download a printable PDF safety sheet for abrasive products.